Lilli ma che bello questo look, le scarpe che hai selezionato mi piacciono tantissimo! Buon week end! i am in love with the red Pumps! Ludo,scelta meravigliosa di scarpe e borsa.Ma ancor di più di quel delizioso cappotto di Mango,adoro. Ciao Lilli. Questo look che hai ricreato è delizioso. Mi piacciono un sacco le righe abbinate al rosso. Brava! HI Lilli, Pernille is one of my style idols. This outfit is so my style except I have to buy red shoes or boots. I would check out Zara to buy that top. Love it! You picked the perfect items to recreate the look. I like the navy and red combo even though I don't have either colours in my wardrobe any longer. Have a great weekend! I love the coat so much. Good job, Lilli! Devo correre da Zara a prendere quelle scarpe!!! I love the heels! Enjoy your weekend my cara! Dear Lilli, cruising around the net is very dangerous. I know what you mean. The Mango jeans is really great and I can imagine you with theses pants. The whole outfit is absolutely my style. I like it casual chic. My dear friend, have a wonderful weekend. Adoro lo stile di Pernille e tu hai riprodotto il suo "navy" look alla perfezione... bellissime le deco dal tacco grosso!!! This is the type of effortlessly chic look I love and it has some flair as well thanks to all the red accents. You did a superb job of replicating the outfit! I actually want the Zara sweater you chose :) Happy weekend dear Lilli! Lilli, com'è che preferisco sempre le tue di proposte rispetto l'originale?!?! I adore that Zara sweater! So chic and I can easily match it with all sorts of pants! Great budget selection here, Lilli and wishing you a brilliant weekend! ciao lilli che bella selezione, hai proprio dato i consigli giusti, ie io ho proprio bisogno di quelle scarpe di Zara!! You picked some fabulous items Lilli! I am especially in love with the flared jeans and blue coat. Mango and Zara just have the greatest items right?. I like the flared jeans, this look is ideal for day by day comfy and trendy. La giacca della prima foto e' bellissima, bellissimo look! Lilli questo è uno dei tuoi "copia l'outfit" migliori! Mi piace tantissimo. 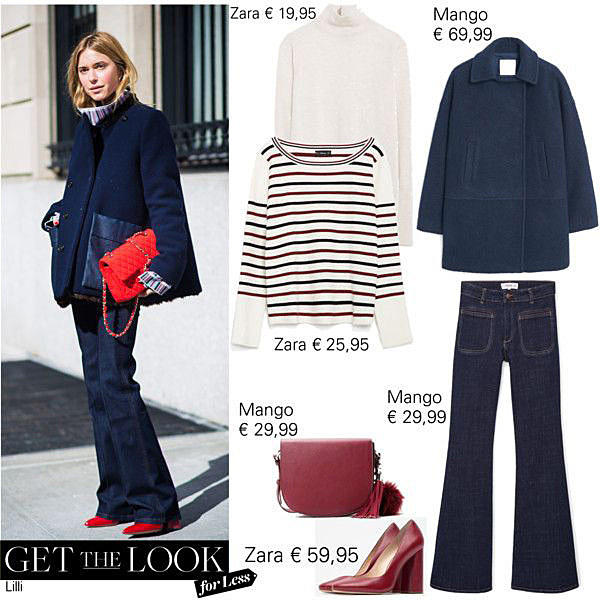 Amo le maglie a righe, amo i flared jeans e l'abbinamento del rosso con il blu. Brava davvero.